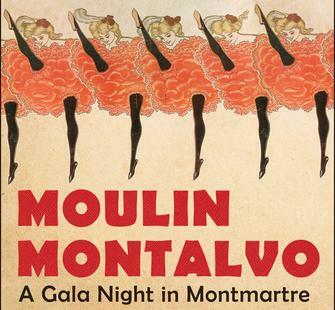 Saturday, June 16, 2018, 5:30 p.m. - 10:30 p.m.
For one spectacular soirée, Montalvo goes back in time to transform into a sensational cabaret! Mingle with artists and can-can dancers. Savor sumptuous cuisine by Le Papillon, paired with Champagne Taittinger and sophisticated French vintages. Dance the night away in the Bal Musette in the historic Villa to the musical stylings of the Money Band. Raise your paddle at an incroyable live auction featuring once-in-a-lifetime experience packages. Nobody throws a party like Montalvo: there is tremendous enthusiasm around this event and tables are limited! Sponsorship opportunities are available. Click here to download a sponsorship packet (PDF). Everybody’s a winner! Take a chance and pull an envelope: 49 guests will take home a delicious box of artisanal chocolates from chocolatier Fleur de Cocoa. Only 50 tickets available at $200 per ticket. Winner will be drawn at the live auction; need not be present to win. To purchase tickets in advance of the event, contact Chris Wilcox at 408-961-5849. 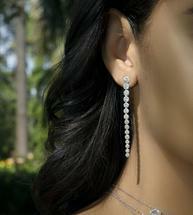 The highlight of the evening will be the spirited live auction! Click for more information about each of our auction packages. Be among the first to view this major art exhibition before it is open to the public! 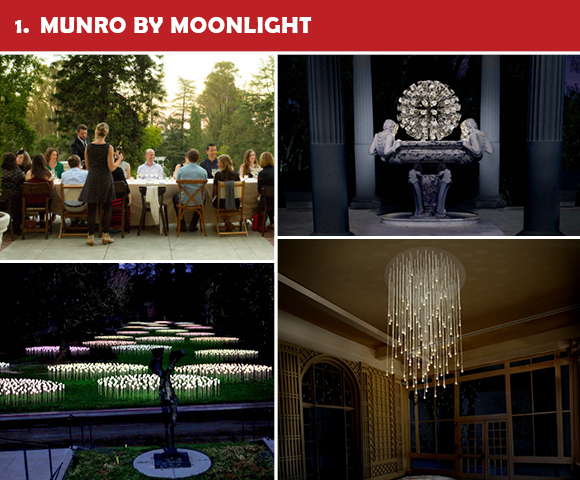 Winning bidders will experience a truly once-in-a-lifetime opportunity to dine with internationally acclaimed lighting artist Bruce Munro and help inaugurate his five-month blockbuster West Coast premiere exhibition, Bruce Munro at Montalvo: Stories in Light! Join the artist for a sumptuous farm-to-table style dinner prepared by Andrea Blum, Montalvo’s resident culinary artist. Paired with wines from Ridge Vineyards and Kathryn Kennedy, the feast will be served outdoors on the Villa’s veranda, followed by a tour of the installation located throughout the Villa’s grounds. 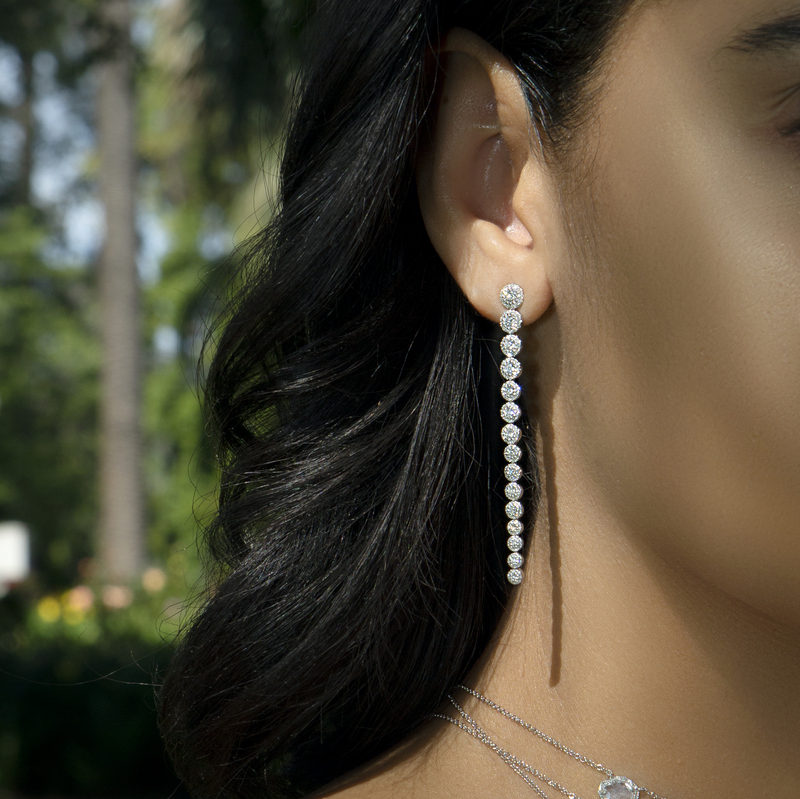 End this amazing evening with dessert, coffee and fine liqueurs at the Italianate Garden while gazing at the immersive light-based installations. Welcome to paradise for 5 luxurious nights! 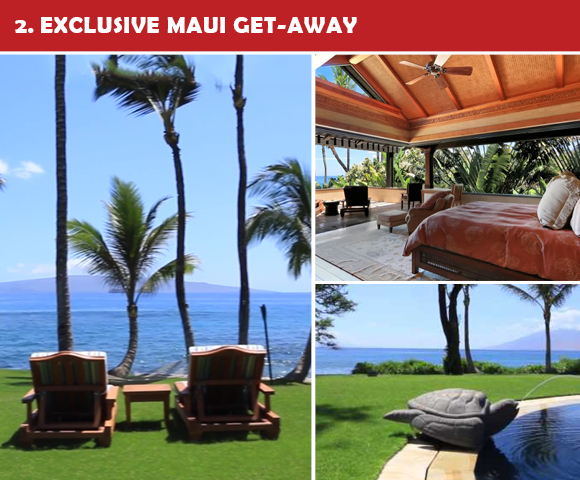 12 guests will indulge and unwind at the magnificent 15,000 square-foot private residence of Steve Finn at Turtle Point Estate on the shores of Makena, Maui! 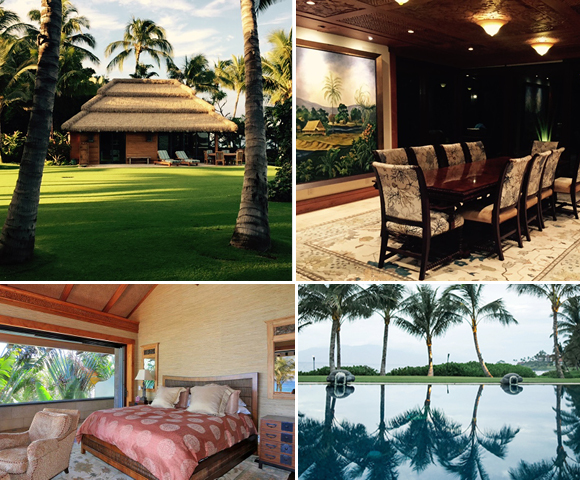 This simply stunning mansion boasts incredible architecture with hand-carved wood and stone throughout and breathtaking panoramic 180 degree views of the Pacific Ocean! It also features world-class amenities including six exquisitely designed suites, two with outdoor showers; an immense great room that opens to the outdoors; luxurious infinity pool and spa; private movie theatre; well-equipped private gym and workout room; beautiful dining room; double staircase to the second level for billiards and an enormous bar; manicured grounds featuring private waterfalls and gorgeous gardens. Maid service is available for an additional fee. To start your stay in appropriate island style, you and your guests will enjoy a welcome reception hosted by Bev Gannon, widely known to be the best chef on the Island, and one of the pioneers of Hawaiian regional cuisine. Don’t miss this once-in-a-lifetime opportunity for an extraordinary experience! 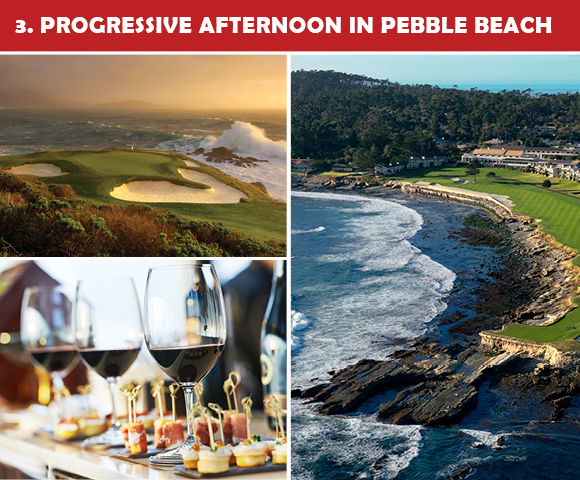 30 winning bidders will be welcomed into three incredible Pebble Beach private estates each with stunning views, art, wine, and cuisine. Guests will gather at Montalvo at 1:30pm to be driven to Pebble Beach in a private shuttle—or meet the shuttle at a designated spot in Pebble Beach if you’d prefer to drive yourself. You will disembark at the art-filled home of Lorna Meyer and Dennis Calas overlooking the ocean near the Carmel Gate. Sip Tondre Wines and nibble hors d’oeuvres while you view Lorna’s stunning collection of California artists including Stephen De Staebler, David Ligare, Danae Mattes, Manuel Neri, Paul Mays, Nathan Oliveira, Wayne Thiebaud, and Peter Voulkos, as well as a number of Carmel artists. The second magnificent home on this tour is located on breathtaking Stillwater Cove, on the fifth hole of the world famous Pebble Beach Golf Course. Constructed of stone and glass, it boasts jaw-dropping views of the ocean. We will be greeted by Montalvo’s Life Trustee, Sally Lucas, and invited to view her beautiful art collection, featuring the work of several former Lucas Artists Fellows, and enjoy sumptuous fare paired with wine from Bernardus Winery. Finally, guests will take a short stroll to the gorgeous home of Angela Hemingway Charles and her husband Glen Charles, co-creator of Cheers and writer for such classics as Taxi, Mary Tyler Moore, and Bob Newhart. It will be a feast for all the senses as guests take in the spectacular views, the Charles’ fabulous international art collection, and savor delicious desserts prepared by Angela and Glen’s private chef, Christophe Bony, formerly Executive and Sous Chef at famed Carmel restaurants Casanova and La Bicyclette. Karen Bria, Fine Wine Specialist with The Estates Group, will be pouring Vintage Ports from Taylor-Fladgate as well as 90+ rated 2015 Napa Valley Cabernets and Bordeaux Blends from Pahlmeyer and Cakebread. Charmaine and Dan Warmenhoven will whisk three lucky couples off to St. Andrews, Scotland in their private jet for 7 days/8 nights of golf, restaurants, and Scotch not to be forgotten! Guests will fly overnight and then enjoy ground transportation to the Warmenhovens’ recently renovated 1845 town home. Previously owned by Peter Thomson, five-time winner of The Open Championship, the house is also about two easy walking blocks from the famous Old Course. While tee times on the Old Course are available by lottery only (which we hope to win one of the days we are there! ), tee times on the adjacent New, Castel, Eden, and Jubilee Courses are guaranteed, as well as other local courses such as Kingsbarns, Balcomie, and Craighead at Crail. 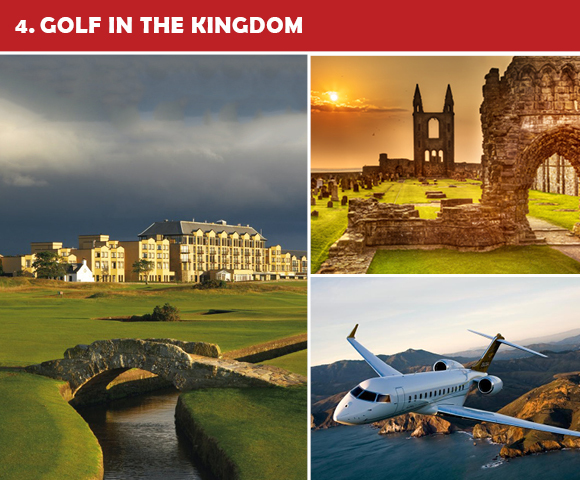 If golf is not your cup of tea, enjoy exploring all that charming, historic St. Andrews has to offer: the ruins of 12th and 13th-century castles and cathedrals, a gorgeous botanical garden, the Museum of the University of St. Andrews (MUSA) with a collection of thousands of artifacts, including medieval maces and stained glass, and the West Sands Beach, where the opening scenes of Chariots of Fire were filmed. Meals will include an assortment of casual pubs and fine dining in local restaurants, noted for their fresh seafood and local produce (haggis is always optional!). Take home a case of Cabernet with your own label on it! The evening will begin with 24 winning bidders bottling a barrel of Cabernet Sauvignon at Paul and Libby Conrado's historic California ranch house. Each guest will get to bottle the wine start to finish, right down to the cork and the label. 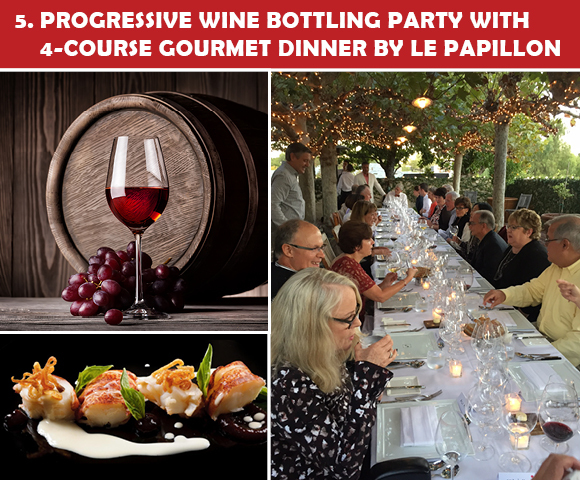 Then, the group will walk across the street to Russ and Marcia Hansen’s gracious home for Kathryn Kennedy Winery sparkling wine and hors d’oeuvres provided by the incomparable Chef Scott Cooper of Le Papillon. This will be followed by a candlelit farm-to-table dining experience in the Conrados’ sycamore-shaded courtyard, featuring delectable cuisine by Le Papillon and accompanied by Paul Conrado’s handcrafted wines. To top it off: each guest will get to go home with a case of the cab they bottled complete with their own personalized Montalvo label. Start thinking of what clever name you want on your bottles!